Pope Francis has called a meeting of Bishops from across the Catholic world to learn about, reflect on and pray about the important issue of "The Protection of Minors in the Church". Bishop Hugh Gilbert, President of the Bishops’ Conference of Scotland, will represent the Church in Scotland throughout the summit which takes place on 21st to 24th February 2019. The Bishops of Scotland have appointed Fr Jim Grant to be the new General Secretary of the Bishops' Conference. Fr Grant is currently Parish Priest of Holy Family Parish in Mossend, Bellshill in the Diocese of Motherwell. He succeeds Mgr Hugh Bradley who was appointed in 2012. Scotland's Bishops have published their General Election Statement. The short document asks voters to consider a series of factors before deciding how to vote. The document repeats previous calls for respect for life and support for families, but makes a special plea this year for EU nationals caught up in the uncertainties of Brexit to be granted security. It also contains a powerful call for a welcome to be afforded to refugees and asylum seekers and denounces the use of weapons of mass destruction as a "serious crime against God and humanity". This General Election presents us with an opportunity to reflect on Catholic social teaching. As Christians, we have a civic and moral duty to engage with our democracy. As Catholics, we believe that the primary goal of society should be the common good; that is the good of all people and of the whole person. Indeed, the common good is the very reason political authority exists. This election provides an opportunity to reflect on the beauty and goodness of Church teaching and to keep that teaching at the forefront of our minds as we engage with candidates across all parties. During elections, a range of issues compete for your attention; we highlight some of them here in the hope that you will reflect on them and raise them with your candidates. Human life at every stage of development is precious and must be protected. Any laws which permit the wilful ending of life must always be rejected as reprehensible and unjust. We must create a culture of life where the most vulnerable are valued and their dignity respected. The undeniable value of human life, created in the image and likeness of God, is fundamental to the Catholic faith. We should remind our politicians that abortion, assisted suicide and euthanasia are always morally unacceptable. Society relies on the building block of the family to exist. The love of man and woman in marriage and their openness to new life is the very basic cell upon which society is built. The wellbeing of society depends on the flourishing and health of family life and those in authority should respond to this with policies that create economic and other advantages for families with children. Sadly, poverty continues to be a scourge for many at home and abroad. Too many people still struggle to make ends meet. This sad reality cannot and should not endure in our country in the twenty-first century. Our concerns should also extend to providing international assistance, while ensuring that aid is not used to support immoral practices such as those which compromise the basic right to life. The United Kingdom should be a place where the most vulnerable are welcomed and given the resources necessary to rebuild their lives. At the same time, we should provide for those people living in and around conflict zones, and commit to working towards the peaceful resolution of conflict.Living in EuropeThere are millions of EU citizens living in the UK and millions of UK citizens living across the EU. Mindful of the uncertainty affecting them, candidates should commit to working towards delivering stability and security for them in future. Our politicians should forge and renew international partnerships and establish rights for those who wish to work in the UK, in a spirit of cooperation and friendship. Millions of people worldwide are persecuted for their beliefs. People of faith, including Christians, should be able to freely practise their faith and bear witness to it in their lives, without fear of prejudice, intolerance, abuse or violence. Candidates should be committed to the right of people not to be forced to act against their conscience. The use of any weapon that causes more than individual and proportionate harm to civilians is immoral and, thus, rejected by the Church. The use of weapons of mass destruction is a serious crime against God and against humanity. While states are entitled to possess the means required for legitimate defence, this must not become an excuse for an excessive accumulation of weaponry which becomes a considerable threat to stability and freedom. Often, politicians are tempted to score points or resort to insults. We need politicians who are willing to change this and to take politics in a new direction, where dialogue is respectful, and where different points of view, including those of a religious nature, are tolerated.As we cast our votes this election, let us bear in mind the words of Pope Francis when he said, “The greatness of any nation is revealed in its effective care of society’s most vulnerable members.” Our nation, our Parliament, and our Government will be judged on how it treats its poorest and most vulnerable citizens. Tributes have been paid to Bishop John Mone, former Bishop of Paisley, who died Friday 14 October aged 87. "We announce the sad news that Bishop John Mone died peacefully this morning just before 6.00am in the Holy Rosary Residence, Greenock. He was taken unwell an hour or so before and passed away tranquilly. Bishop John was a holy man of God who was a gentle and faithful pastor of his people and who was dearly loved by the faithful, clergy and religious of Paisley diocese. May he rest in peace. Our condolences go to his family who will thank God for his good life along with the people of the diocese. Our heartfelt gratitude to Mother Stephen, the sisters and staff of the Holy Rosary Residence who cared for him lovingly to the end. Bishop John was given special spiritual care by Mons. Gerry Gallagher and we remember him too in our prayers." The Bishops’ Conference of Scotland has appointed a new director of the Catholic Parliamentary Office. Archbishop Philip Tartaglia, president of the Scottish Bishops’ Conference, offered congratulations to Anthony Horan who will take up the post from July 25. The position has been vacant since John Deighan resigned in April 2015 to become CEO of the Society for the Protection of Unborn Children Scotland. Mr Horan most recently worked as a solicitor and acting legal manager for Glasgow City Council and has worked for the Scottish Legal Aid Board and JC Hughes Solicitors. Pope Francis has today appointed Monsignor Brian McGee as the new Bishop of the Diocese of Argyll and the Isles. The diocese has been vacant since April 2014 when Bishop Joseph Toal became the Bishop of Motherwell. Mgr. McGee is currently Vicar General of the Diocese of Paisley and Parish Priest of Holy Family Parish, Port Glasgow. “I am excited about coming to the diocese of Argyll and the Isles. It has an ancient and proud heritage whose roots stretch back almost one and a half thousand years preceding even its spiritual father, Saint Columba. Since then, the consistent witness to Christ and the contribution to the National and Universal Church have been immense and I pray that it will continue to be so. I am also mindful of the diocese’s rich Gaelic character and I, although not yet a Gaelic speaker, will endeavour to promote its rightful use in the worship of God. “Many congratulations to Bishop Elect Brian on his appointment by Pope Francis to the See of Argyll and the Isles. I am not at all surprised that he has been chosen for this important office. Since appointing him as my Vicar General and getting to know and see him at work I have been highly impressed by his wisdom about the ways of the Church, his personal commitment to living the Gospel and his sense of service to the clergy and people of the diocese. He is loved and respected dearly by his own parishioners in Holy Family, Port Glasgow, who will miss him, and his elevation leaves big shoes to fill in the diocese of Paisley. “It is with gratitude that we the clergy and faithful of the diocese of Argyll and the Isles welcome the news that Pope Francis has appointed Mgr Brian McGee as the new bishop of our diocese. We welcome him with joy and he can be sure of the support, cooperation, affection and prayers of the community of the diocese as he begins his ministry of leadership and service. 1.Bishop-Elect McGee will be ordained at St. Columba’s Cathedral in Oban at a date to be advised. Born Greenock 8th October 1965. Parents: Seamus and Brighid McGee. Father born in Moville, Ireland moved to Greenock aged five. Mother born Belfast, Ireland moved to Greenock after marriage, 1964. Father engineer fitter, died 1981. Mother Primary teacher. Siblings: Brona, Ciaran and Kevin. Both brothers died as infants. Brona is a nurse and currently is Director of Care at St Vincent’s Hospice, Howwood. Pope Francis has today (Saturday 22 November 2014) appointed Fr. William Nolan, as Bishop of Galloway. Fr. Nolan is currently parish priest of Our Lady of Lourdes, East Kilbride and Vicar General of the Diocese of Motherwell. Reacting to the announcement, Bishop-Elect Nolan said; "I am overawed to be appointed by Pope Francis as Bishop of Galloway. I already know some of the clergy and I look forward to working with them and with the the people of the Diocese to help the faith flourish in the land where Ninian planted the seeds of faith so long ago. I wish to serve the Diocese as best I can, but knowing I am hindered by my failings and weaknesses, I ask everyone to pray for me." Bishop-Elect Nolan added; "The last 20 years of my life have been spent in Our Lady of Lourdes parish East Kilbride. I wish to pay tribute to the people of the parish for their kindness and support to me over the years. My move to Galloway is tinged with sadness at leaving Our Lady of Lourdes behind." 4th of 11 children born to William and Catherine Nolan (both deceased) - 5 girls and 6 boys. Form Master at Blairs College was Fr Peter Moran who is now Emeritus Bishop of Aberdeen. Mgr Maurice Taylor, emeritus Bishop of Galloway was Parish Priest of Our Lady of Lourdes East Kilbride when he was appointed Bishop of Galloway in 1981. When first ordained Fr Nolan was sent as a curate to Our Lady of Lourdes and served under Mgr Taylor. Fr Nolan is now the second Parish Priest of Our Lady of Lourdes to become Bishop of Galloway. 2. Bishop John Cunningham has been the Bishop of Galloway since May 2004. 3. The date of the Episcopal Ordination of Bishop-Elect Nolan will be announced in due course. Pope Francis has today (Saturday 8 February 2014) appointed Fr John Keenan, as Bishop of Paisley. The Diocese of Paisley has been vacant since September 2012, when Bishop Philip Tartaglia became Archbishop of Glasgow. Fr David Boyd has been the Administrator of the Diocese in the interim. “I welcome the appointment of Father John Keenan as Bishop of Paisley. As Archbishop of Glasgow, I am glad that a priest of the Archdiocese has been named by Pope Francis as Bishop of Paisley. Father Keenan has been a much-loved and respected Parish Priest, and an inspirational Catholic Chaplain to Glasgow University (Turnbull Hall). His appointment gives me a huge headache in trying to replace him. But, in the Church, when one part of the body is made stronger, the whole body benefits. So, in this case, Paisley’s delight is Glasgow’s joy, and I am certain that Fr Keenan will be a fine bishop for Paisley. As a former of Bishop of Paisley, I am very happy that the Diocese of Paisley now has a new Bishop. It’s a great diocese and very supportive of its bishops. Bishop-Elect John Keenan can expect a warm and heartfelt welcome throughout the diocese. I was very happy as Bishop of Paisley and I am sure he will be too. "I was absolutely delighted to hear that the Holy Father, Pope Francis, had nominated as bishop of Paisley Diocese Fr. John Keenan. Over the past seventeen months since Archbishop Tartaglia left for Glasgow we have been praying at many masses in our diocese for, "a pastor who will please you by his holiness and to show us watchful care". I am certain that in Bishop Elect John Keenan, that prayer has been answered. On behalf of Bishop Emeritus John Mone, the priests and deacons and lay faithful of the Diocese of Paisley, I can assure Bishop Elect John a very warm welcome and the assurance of our prayers and support. Over the past seventeen months, as Administrator, I have been taken aback time and time again by the support, energy and good will of all the clergy and people of this Diocese. I am certain that Bishop Elect John will also experience this and that we will hopefully make him feel at home very quickly". 2. The installation of the new bishop will take place in St. Mirin’s Cathedral, Paisley on Wednesday 19 March 2014, the Feast of St. Joseph. 3. Bishop Elect John Keenan will become Scotland’s youngest Bishop following his Episcopal Ordination on 19 March. 4. The Diocese of Paisley was established in 1947 to serve the Roman Catholic Community within Inverclyde, Renfrewshire & East Renfrewshire (excluding Thornliebank). Although a small Diocese in geographical terms, the Diocese serves an eighth of the Catholic population of Scotland. 5. The appointment of Bishop Elect John Keenan, is the third Scottish Episcopal appointment made by Pope Francis since his election on 13 March 2013. He appointed Archbishop Leo Cushley as Archbishop of St, Andrews & Edinburgh on 24 July 2013 and Bishop Stephen Robson as Bishop of Dunkeld on 11 December 2013. The Pastoral Letter from the Bishops' Conference of Scotland on the occasion of the feast of Christ the King may be downloaded HERE. Pope Francis has today appointed Bishop Stephen Robson, currently Auxiliary Bishop of the Archdiocese of St. Andrews and Edinburgh as the new Bishop of Dunkeld. Bishop Robson will replace Bishop Vincent Logan who stood down as Bishop of Dunkeld after almost 30 years in December 2010 on health grounds. Monsignor Basil O’Sullivan has been the Administrator of the Diocese in the interim. 1. Biography - Right Rev Bishop Stephen Robson, Auxiliary Bishop of the Archdiocese of St. Andrews and Edinburgh. Chaplain of His Holiness, 2008-date; Chancellor Archdiocese of St Andrew’s and Edinburgh, 2007-date; Moderator of the Curia in the Archdiocese. Parish Priest of SS John Cantius and Nicholas, Broxburn (2-12-present. Dob: 1.4.1951. Parents: Leslie and Margery Robson. Ordained: 17.3.1979. Education: University of Edinburgh BSc, 1974; MTh, 1986; Pontifical Gregorian University, Rome, STL, 2000, STD, 2003, JCL, 2006. Publications: With the Spirit and Power of Elijah, 2004 (Published Doctoral dissertation, Pontifical University Gregorian Press). Recreations: Music, reading, cinema, theatre. Clubs and Societies: Member of Institute of Biology; Chartered Biologist of Institute of Biology; Member of Canon Law Society of Great Britain & Ireland. Appointed Auxiliary Bishop of the Archdiocese of St. Andrews and Edinburgh, Titular Bishop of Tannuna, Tuesday 8 May 2012; Consecrated Bishop 9th June 2012, St Mary’s Cathedral Edinburgh. 2. Bishop Robson was awarded The Bellarmine medal in 2004. The Bellarmine medal is a gold doctoral medal awarded annually to the two best doctoral theses submitted each year - one in philosophy and one in theology by the Gregorian University in Rome. He was awarded the theology award in 2004 for his thesis on St Bernard of Clairvaux's spiritual theology. 3. The installation of the new bishop will take place in St. Andrew’s Cathedral in Dundee very early in January on a date to be announced shortly. Bishop Robson has chosen as his Episcopal Motto: Peregrinator pro Christo - Pilgrim for Christ. The Episcopal Ordination of Archbishop-elect Leo Cushley will take place at St. Mary's Cathedral, Edinburgh at 11am on Saturday 21st September 2013. Archbishop Elect Cushley who was appointed new Archbishop of St. Andrews and Edinburgh by Pope Francis on 24 July will become the eighth Archbishop of St. Andrews and Edinburgh since the restoration of the Catholic Hierarchy in 1878. Cardinal James Harvey, who will be the principal consecrator and principal celebrant of the Mass of Episcopal Ordination/Consecration. Cardinal Harvey was Mgr. Cushley's first superior in the Secretariat of State and is a long-time colleague in the diplomatic service. 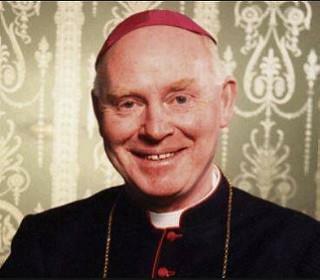 Cardinal Harvey also worked as a deacon in a parish Edinburgh in the summer of 1974. Cardinal Harvey is from Wisconsin, USA. His Excellency Archbishop Antonio Mennini, Apostolic Nuncio to Great Britain, the Popes representative in the United Kingdom. Most Rev. Philip Tartaglia, Archbishop of Glasgow, in his capacity as Apostolic Administrator of the Archdiocese of St Andrews and Edinburgh. Among the guests will be: Rt. Hon Alex Salmond, the First Minister, the Moderator of the General Assembly, Dr Lorna Hood, Bishop John Armes Episcopal Bishop of Edinburgh, the British Ambassador to the Holy See, Nigel Baker, together with the Catholic Bishops of Scotland and other civic and religious dignitaries. Pope Francis has today, July 24, 2013, appointed Monsignor Leo Cushley as Archbishop of St. Andrews & Edinburgh. The new Archbishop will take over the governance of the Archdiocese from Archbishop Philip Tartaglia who has been Apostolic Administrator following the resignation of Cardinal Keith O'Brien, who was Archbishop from August 1985 until March 2013. Mgr Cushley is presently Head of the English-language section of the Vatican’s Secretariat of State and has been a close collaborator of both Pope Benedict XVI and Pope Francis. In his capacity as Prelate of the Anticamera Mgr Cushley has been regularly involved in the visits of Heads of State and other important guests to the Holy See. Recently he has assisted as Angela Merkel, the German Chancellor, the Archbishop of Canterbury and many other high profile visitors called upon the Pope. As Head of the English section of the Secretariat of State it was his task to accompany the Holy Father to English-speaking countries. During 2010 he accompanied Pope Benedict to Malta and Cyprus as well as the United Kingdom. During that visit, at Bellahouston, Mgr Cushley had the pleasure of presenting his family to Pope Benedict. Commenting on his appointment, Mgr Cushley said: “I am humbled that our Holy Father Pope Francis has nominated me for such an important task here in our ancient capital. I know it's a delicate moment and that there is a lot to be done, but with God's grace and the kind support of the clergy and people of Edinburgh, I will work cheerfully and willingly with all the energy I can muster. “There are certain important questions that I will also have to familiarize myself with. I have no jurisdiction in the diocese until after I have been ordained in late September. Only then will I be able to take stock of what has happened and see what can be done. Mgr Cushley counts among his pastimes hillwalking in the Scottish mountains and in the Abruzzi region of central Italy. He is looking forward to getting acquainted with the Scottish hills again. He has driven between Rome and Scotland seven times and has enjoyed every minute of it. His new role will mean that he will now surrender his distinctive Vatican number plate as well as his diplomatic passport. Mgr Cushley is also a regular jogger and listens to audiobooks while running/walking 10km three times a week in Rome. He describes himself as “completely rubbish” on the golf course, but enjoys watching the sport (he was at the Open Championship at Muirfield last Saturday). Musically his tastes range from U2 to opera by Puccini, Verdi or Mozart. 1. The Archbishop-elect's episcopal ordination will take place in St.
Mary's Cathedral in Edinburgh on 21st September 2013, when he will assume the governance of the Archdiocese. Further details of that ceremony will be issued when finalised. Until that ceremony the Archbishop-elect continues to be addressed as “Monsignor Cushley”. Born, 18 June 1961 in Airdrie, Lanarkshire, to Bill and Eileen Cushley, who married in 1960. Both were natives of Lanarkshire; Bill a baker and Eileen a secretary. Bill Cushley died in 2007. Mgr Cushley has a brother and sister, Carey (b. 1963), and Kenneth (b. 1966). Carey, a primary school teacher, and Kenneth, an electrician, are both married, Carey having two children and Kenneth one, and all live in the west of Scotland. He was ordained to the priesthood on 7th July 1985 at St John the Baptist’s, Uddingston, by Bishop Joseph Devine. Presently Mgr Cushley works in the Vatican as Prelate of the Anticamera and Head of the English-language section of the Vatican Secretariat of State. He has been a priest of Motherwell Diocese for 28 years, and was active in the diocese 1987-1993. He was asked to work for the Holy See in 1993, and has served in its Diplomatic Service since 1997. Head of the English-language section, Secretariat of State, Vatican (since 2009) (As the head of the English-language section, Mgr Cushley was the head of a team of writers and translators who have a series of tasks related to whatever the Pope requires in the English language. The work also includes interpreting from English when the Holy Father or the Cardinal Secretary of State request assistance. Mgr Cushley speaks Italian, French, Spanish and Portuguese. Archbishop Gerhard Müller the Prefect of the Congregation for the Doctrine of the Faith visited Scotland in June 2013 to deliver the prestigious "Cardinal Winning Lecture" at the University of Glasgow. The Archbishop who heads the Vatican department charged with promoting and safeguarding Catholic doctrine has a long standing relationship with Scotland and has visited many times. For ten years he was Bishop of Regensburg, which is twinned with Aberdeen, and has visited as the guest of both Bishops Conti and Moran on a number of occasions. He also brought a message from Pope Francis to Scotland's Catholics, visited a Catholic Primary School, delivered a spiritual reflection to clergy and celebrated Mass in St. Andrew's Cathedral in Glasgow. Pope Francis has asked Archbishop Müller to convey his "greetings to Catholic teachers and to those preparing them at Glasgow University and good wishes for the success of the Saint Andrew's Foundation for Catholic teacher education." The Pope has also asked the Archbishop to "greet warmly all the Catholics of Scotland, especially the priests whom you will meet during your visit. Aware of recent challenges and of the crosses they have patiently borne." "It is opportune at this present moment, amidst the rapidly changing state of society, of higher education generally and also of the Church, to reflect on the nature and distinctiveness of Catholic Education and on the challenges it both faces and also presents." "the State has the duty and responsibility to facilitate the wishes of Catholic parents to educate their children according to their desire to pass on their faith to their children." Commenting on the, "overarching secular tone of society today" and a "growing acceptance of a relativist stance with regard to truth and morality" Archbishop Müller warned against the assumption that "human freedom essentially entails creating one’s own truth and moral good." Adding that there are "logical absurdities in the relativists position: first – in asserting as absolutely true that there is no absolute truth; second – in maintaining that each person’s truth is as valuable as another’s; and third – in asserting that each person’s morality is as good as the other’s. The first represents the collapse of reason; the second and third, if pursued to their logical conclusion, would lead to the breakdown of society." Archbishop Müller concluded with, "In the midst of so many diverse and at times bewildering versions of educational aims and processes, the Church has a rich and vital vision to proclaim." Adding; "May this new Institute play an important role in the study of this vision, its dissemination for the formation of Catholic teachers, and support of the schools in which this vision becomes realised." Message from Pope Francis to Archbishop Muller on the occasion of his trip to Scotland. Address made to a gathering of priests from all over Scotland at Motherwell Cathedral Friday 14th June 2013. Homily given at a Mass in Glasgow's St Andrew's Cathedral celebrating Catholic Education and the launch of the St Andrew's Foundation at Glasgow University. Address given at the formal launch of the St Andrew's Foundation. Eminence shall be agreed with the Holy See. concordare con la Santa Sede. Argentinian Cardinal Jorge Mario Bergoglio has been elected Pope. He was chosen on the fifth round of votes by the 115 cardinals meeting in the Sistine Chapel to select Pope Benedict XVI's successor. He is the first Latin American and the first Jesuit to become Bishop of Rome, and has chosen the name Francis. "He is a man of firsts. The first Latin American. The first Jesuit. The first Pope Francis. I think we can take from his first appearance that he is a humble, spiritual and calm man. A reconciler and healer, with a strong background on social justice. His name reminds us of the little saint of Assisi. A simple man who was the poor servant of Jesus and who was given the message 'rebuild my church'. It is a very significant message for our time. He may also have in mind St Francis Xavier the great missionary and a reminder of the need for a new evangelisation. "We missed having a Pope. Catholics feel the need for Peter. We now have Peter back. The new Pope will give us joy and confidence."